The total energy of an isolated system remains constant over time. Newton’s cradle. A device that demonstrates the Law of Conservation of Mechanical Energy and Momentum. Energy can be defined as the capacity for doing work. It may exist in a variety of forms and may be transformed from one type of energy to another in hundreds of ways. For example, burning gasoline to power cars is an energy conversion process we rely on. The chemical energy in gasoline is converted to thermal energy, which is then converted to mechanical energy that makes the car move. The mechanical energy has been converted to kinetic energy. When we use the brakes to stop a car, that kinetic energy is converted by friction back to heat, or thermal energy. A consequence of the law of conservation of energy is that a perpetual motion machine of the first kind, which produces work without the input of energy, cannot exist. The total mechanical energy (defined as the sum of its potential and kinetic energies) of a particle being acted on by only conservative forces is constant. The potential energy, U, depends on the position of an object subjected to a conservative force. It is defined as the object’s ability to do work and is increased as the object is moved in the opposite direction of the direction of the force. The potential energy associated with a system consisting of Earth and a nearby particle is gravitational potential energy. The kinetic energy, K, depends on the speed of an object and is the ability of a moving object to do work on other objects when it collides with them. The above mentioned definition (Emech = U + K) assumes that the system is free of friction and other non-conservative forces. The difference between a conservative and a non-conservative force is that when a conservative force moves an object from one point to another, the work done by the conservative force is independent of the path. In any real situation, frictional forces and other non-conservative forces are present, but in many cases their effects on the system are so small that the principle of conservation of mechanical energy can be used as a fair approximation. For example the frictional force is a non-conservative force, because it acts to reduce the mechanical energy in a system. Note that non-conservative forces do not always reduce the mechanical energy. A non-conservative force changes the mechanical energy, there are forces that increase the total mechanical energy, like the force provided by a motor or engine, is also a non-conservative force. Assume a pendulum (ball of mass m suspended on a string of length L that we have pulled up so that the ball is a height H < L above its lowest point on the arc of its stretched string motion. The pendulum is subjected to the conservative gravitational force where frictional forces like air drag and friction at the pivot are negligible. We release it from rest. How fast is it going at the bottom? The pendulum reaches greatest kinetic energy and least potential energy when in the vertical position, because it will have the greatest speed and be nearest the Earth at this point. On the other hand, it will have its least kinetic energy and greatest potential energy at the extreme positions of its swing, because it has zero speed and is farthest from Earth at these points. 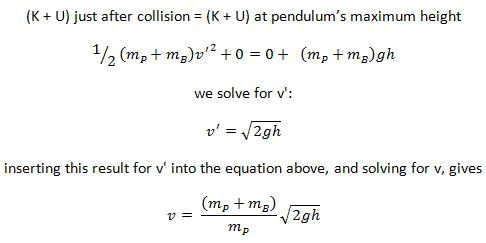 where L is the length of the pendulum and g is the local acceleration of gravity. For small swings the period of swing is approximately the same for different size swings. That is, the period is independent of amplitude. We now take into account nonconservative forces such as friction, since they are important in real situations. For example, consider again the pendulum, but this time let us include air resistance. The pendulum will slow down, because of friction. In this, and in other natural processes, the mechanical energy (sum of the kinetic and potential energies) does not remain constant but decreases. Because frictional forces reduce the mechanical energy (but not the total energy), they are called nonconservative forces (or dissipative forces). But in the nineteenth-century it was demonstrated the total energy is conserved in any process. In case of pendulum its initial kinetic energy is all transformed into thermal energy. The total energy E of a system (the sum of its mechanical energy and its internal energies, including thermal energy) can change only by amounts of energy that are transferred to or from the system. A perfectly elastic collision is defined as one in which there is no net conversion of kinetic energy into other forms (such as heat or noise). For the brief moment during which the two objects are in contact, some (or all) of the energy is stored momentarily in the form of elastic potential energy. But if we compare the total kinetic energy just before the collision with the total kinetic energy just after the collision, and they are found to be the same, then we say that the total kinetic energy is conserved. Some large-scale interactions like the slingshot type gravitational interactions (also known as a planetary swing-by or a gravity-assist manoeuvre) between satellites and planets are perfectly elastic. Collisions between very hard spheres may be nearly elastic, so it is useful to calculate the limiting case of an elastic collision. Collisions in ideal gases approach perfectly elastic collisions, as do scattering interactions of sub-atomic particles which are deflected by the electromagnetic force. Rutherford scattering is the elastic scattering of charged particles also by the electromagnetic force. A neutron-nucleus scattering reaction may be also elastic, but in this case the neutron is deflected by the strong nuclear force. The relative speed of the two objects after the collision has the same magnitude (but opposite direction) as before the collision, no matter what the masses are. It is known the fission neutrons are of importance in any chain-reacting system. All neutrons produced by fission are born as fast neutrons with high kinetic energy. Before such neutrons can efficiently cause additional fissions, they must be slowed down by collisions with nuclei in the moderator of the reactor. 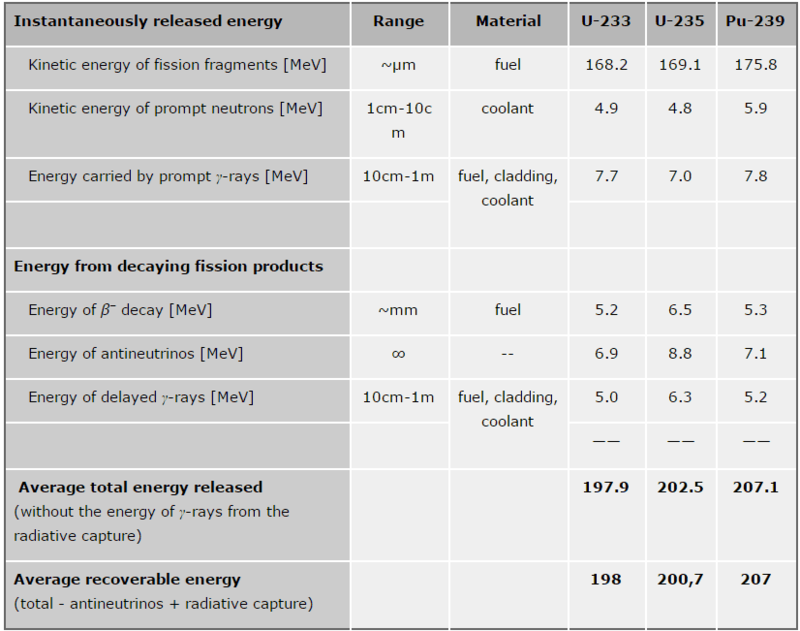 The probability of the fission U-235 becomes very large at the thermal energies of slow neutrons. This fact implies increase of multiplication factor of the reactor (i.e. lower fuel enrichment is needed to sustain chain reaction). The neutrons released during fission with an average energy of 2 MeV in a reactor on average undergo a number of collisions (elastic or inelastic) before they are absorbed. During the scattering reaction, a fraction of the neutron’s kinetic energy is transferred to the nucleus. 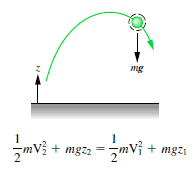 Using the laws of conservation of momentum and energy and the analogy of collisions of billiard balls for elastic scattering, it is possible to derive the following equation for the mass of target or moderator nucleus (M), energy of incident neutron (Ei) and the energy of scattered neutron (Es). where A is the atomic mass number.In case of the hydrogen (A = 1) as the target nucleus, the incident neutron can be completely stopped. But this works when the direction of the neutron is completely reversed (i.e. scattered at 180°). In reality, the direction of scattering ranges from 0 to 180 ° and the energy transferred also ranges from 0% to maximum. Therefore, the average energy of scattered neutron is taken as the average of energies with scattering angle 0 and 180°. 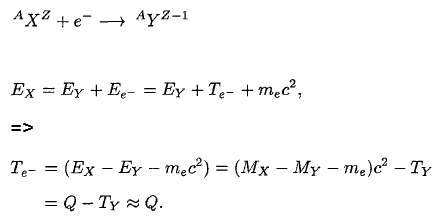 From these equations it is easy to determine the number of collisions required to slow down a neutron from, for example from 2 MeV to 1 eV. 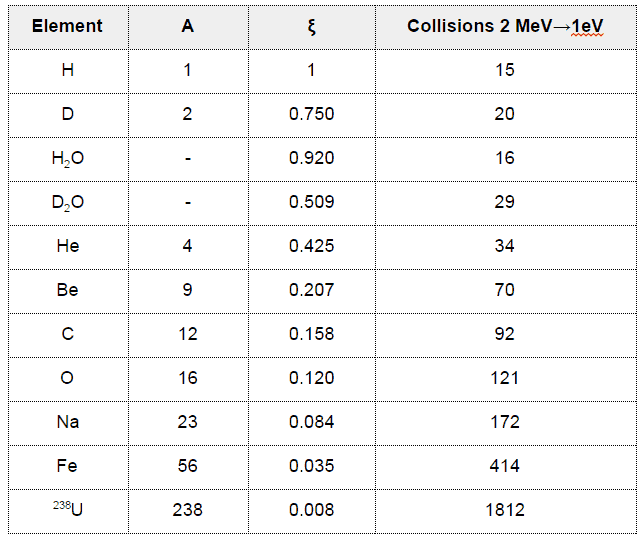 Example: Determine the number of collisions required for thermalization for the 2 MeV neutron in the carbon. Table of average logarithmic energy decrement for some elements. A neutron (n) of mass 1.01 u traveling with a speed of 3.60 x 104m/s interacts with a carbon (C) nucleus (mC = 12.00 u) initially at rest in an elastic head-on collision. What are the velocities of the neutron and carbon nucleus after the collision? This is an elastic head-on collision of two objects with unequal masses. We have to use the conservation laws of momentum and of kinetic energy, and apply them to our system of two particles. We can solve this system of equation or we can use the equation derived in previous section. This equation stated that the relative speed of the two objects after the collision has the same magnitude (but opposite direction) as before the collision, no matter what the masses are. The minus sign for v’ tells us that the neutron scatters back of the carbon nucleus, because the carbon nucleus is significantly heavier. On the other hand its speed is less than its initial speed. This process is known as the neutron moderation and it significantly depends on the mass of moderator nuclei. An inelastic collision is one in which part of the kinetic energy is changed to some other form of energy in the collision. Any macroscopic collision between objects will convert some of the kinetic energy into internal energy and other forms of energy, so no large scale impacts are perfectly elastic. For example, in collisions of common bodies, such as two cars, some energy is always transferred from kinetic energy to other forms of energy, such as thermal energy or energy of sound. The inelastic collision of two bodies always involves a loss in the kinetic energy of the system. The greatest loss occurs if the bodies stick together, in which case the collision is called a completely inelastic collision. Thus, the kinetic energy of the system is not conserved, while the total energy is conserved as required by the general principle of conservation of energy. 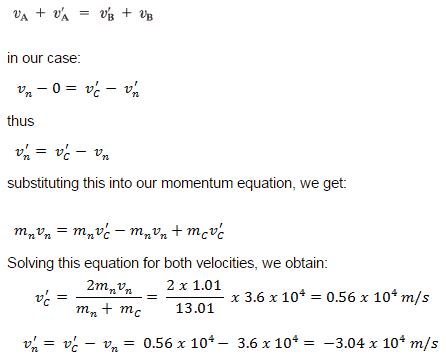 Momentum is conserved in inelastic collisions, but one cannot track the kinetic energy through the collision since some of it is converted to other forms of energy. In nuclear physics, an inelastic collision is one in which the incoming particle causes the nucleus it strikes to become excited or to break up. Deep inelastic scattering is a method of probing the structure of subatomic particles in much the same way as Rutherford probed the inside of the atom (see Rutherford scattering). where Et is known as the inelastic threshold energy and ε1 is the energy of the first excited state. Therefore especially scattering data of 238U, which is a major component of nuclear fuel in commercial power reactors, are one of the most important data in the neutron transport calculations in the reactor core. The ballistic pendulum is a kind of “transformer,” exchanging the high speed of a light object (the bullet) for the low speed of a massive object. A ballistic pendulum is a device for measuring the velocity of a projectile, such as a bullet. The ballistic pendulum is a kind of “transformer,” exchanging the high speed of a light object (the bullet) for the low speed of a massive object (the block). When a bullet is fired into the block, its momentum is transferred to the block. The bullet’s momentum can be determined from the amplitude of the pendulum swing. When the bullet is embedding itself in the block, it occurs so quickly that the block does not move appreciably. The supporting strings remain nearly vertical, so negligible external horizontal force acts on the bullet–block system, and the horizontal component of momentum is conserved. Mechanical energy is not conserved during this stage, however, because a nonconservative force does work (the force of friction between bullet and block). In the second stage, the bullet and block move together. The only forces acting on this system are gravity (a conservative force) and the string tensions (which do no work). Thus, as the block swings, mechanical energy is conserved. 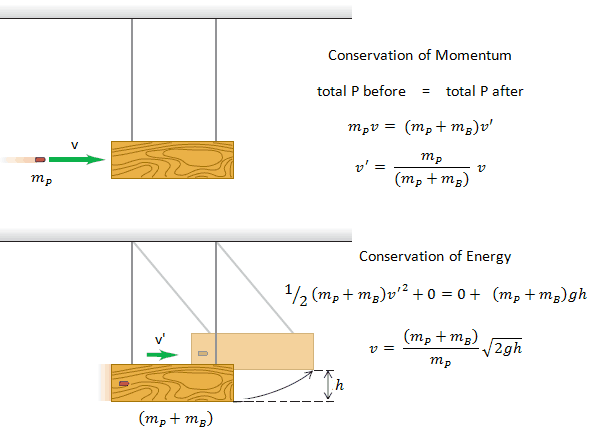 Momentum is not conserved during this stage, however, because there is a net external force (the forces of gravity and string tension don’t cancel when the strings are inclined). where v is the initial velocity of the projectile of mass mP. v’ is the velocity of the block and embedded projectile (both of mass mP + mB) just after the collision, before they have moved significantly. which is the initial velocity of the projectile and our final result. 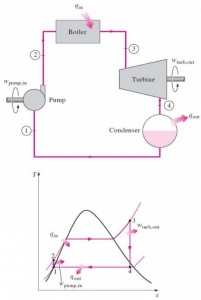 The law of conservation of energy can be used also in the analysis of flowing fluids. This equation is the most famous equation in fluid dynamics. The Bernoulli’s equation describes the qualitative behavior flowing fluid that is usually labeled with the term Bernoulli’s effect. 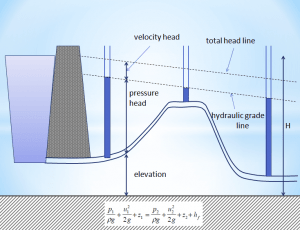 This effect causes the lowering of fluid pressure in regions where the flow velocity is increased. This lowering of pressure in a constriction of a flow path may seem counterintuitive, but seems less so when you consider pressure to be energy density. In the high velocity flow through the constriction, kinetic energy must increase at the expense of pressure energy. 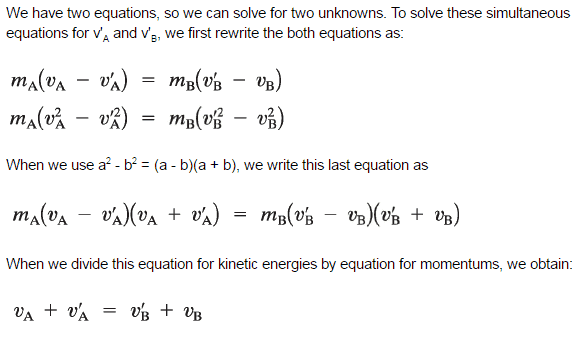 The dimensions of terms in the equation are kinetic energy per unit volume. The equation above assumes that no non-conservative forces (e.g. friction forces) are acting on the fluid. This is very strong assumption. 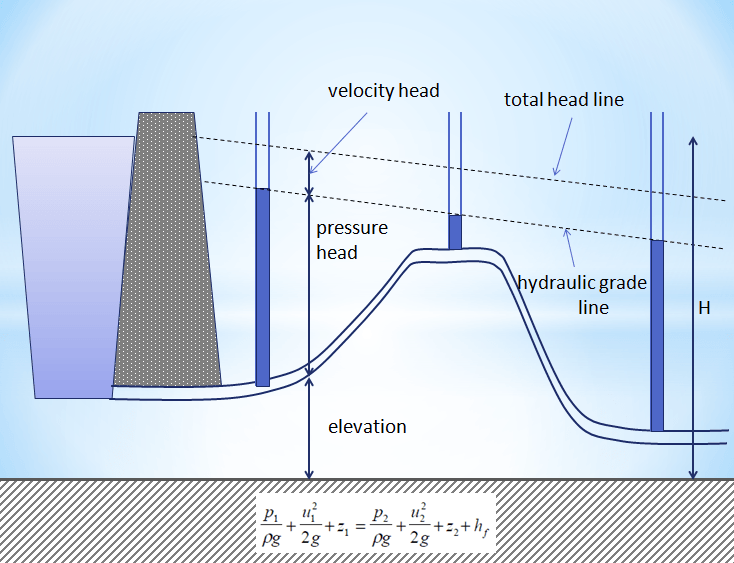 The Bernoulli’s equation can be modified to take into account gains and losses of head, caused by external forces and non-conservative forces. The resulting equation, referred to as the extended Bernoulli’s equation, is very useful in solving most fluid flow problems. The following equation is one form of the extended Bernoulli’s equation. This phenomenon can be seen also in case of reactor coolant pumps. Generally reactor coolant pumps are very powerful, they can consume up to 6 MW each and therefore they can be used for heating the primary coolant before a reactor startup. For example from 30°C at cold zero power (CZP) up to 290°C at hot zero power (HZP). 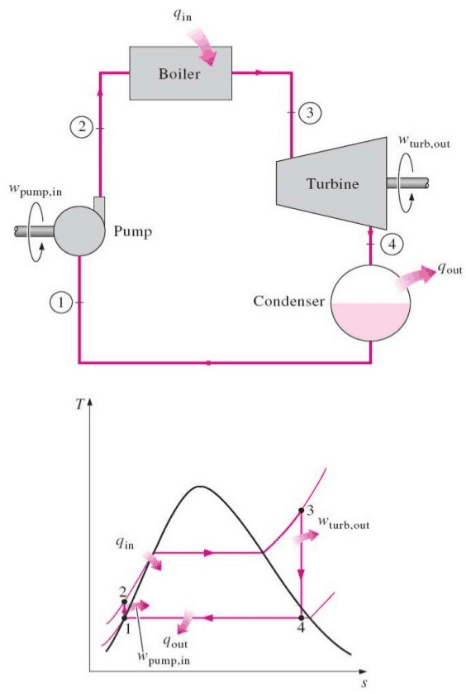 Physical layout of the four main devices used in the Rankine cycle and basic energy transfers. where Eint represents the internal energy of the material, which depends only on the material’s state (temperature, pressure, and volume). Q is the net heat added to the system and W is the net work done by the system. We must be careful and consistent in following the sign conventions for Q and W. Because W in the equation is the work done by the system, then if work is done on the system, W will be negative and Eint will increase. Similarly, Q is positive for heat added to the system, so if heat leaves the system, Q is negative. This tells us the following: The internal energy of a system tends to increase if heat is absorbed by the system or if positive work is done on the system. Conversely, the internal energy tends to decrease if heat is lost by the system or if negative work is done on the system. It must be added Q and W are path dependent, while Eint is path independent. The internal energy Eint of a system tends to increase if energy is added as heat Q and tends to decrease if energy is lost as work W done by the system. Heat and/or work can be directed into or out of the control volume. But, for convenience and as a standard convention, the net energy exchange is presented here with the net heat exchange assumed to be into the system and the net work assumed to be out of the system. 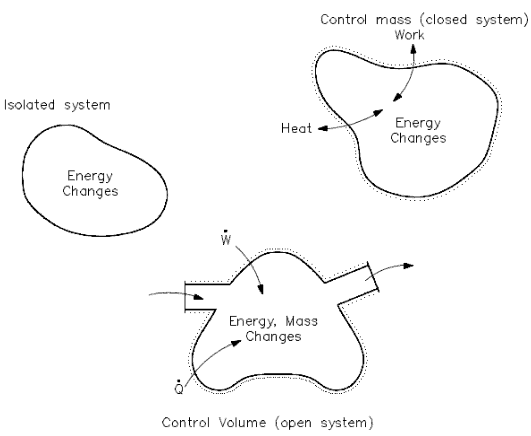 If no mass crosses the boundary, but work and/or heat do, then the system is referred to as a “closed” system. If mass, work and heat do not cross the boundary (that is, the only energy exchanges taking place are within the system), then the system is referred to as an isolated system. Isolated and closed systems are nothing more than specialized cases of the open system. 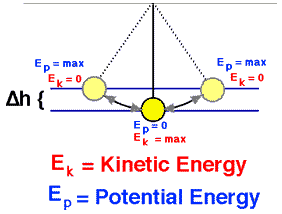 The law of conservation of energy can be used also in the analysis of electrical circuits. In the analysis of electrical circuits the principle of energy conservation provides basis for the law, which is known as Kirchhoff’s voltage law (or Kirchhoff’s second law), after German physicist Gustav Robert Kirchhoff. The algebraic sum of the voltages (drops or rises) encountered in traversing any loop of a circuit in a specified direction must be zero. Simply, the voltage changes around any closed loop must sum to zero. 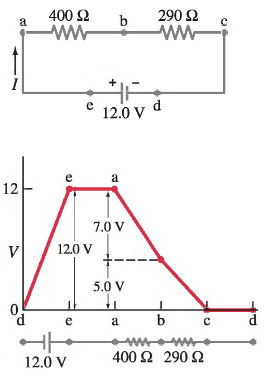 The sum of the voltage rises is equal to the sum of the voltage drops in a loop. 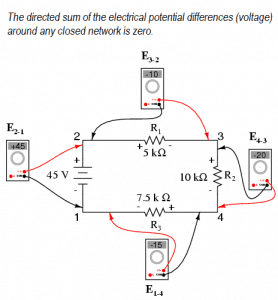 No matter what path you take through an electric circuit, if you return to your starting point you must measure the same voltage, constraining the net change around the loop to be zero. Since voltage is electric potential energy per unit charge, the voltage law can be seen to be a consequence of conservation of energy. This rule is equivalent to saying that each point on a mountain has only one elevation above sea level. If you start from any point and return to it after walking around the mountain, the algebraic sum of the changes in elevation that you encounter must be zero. The voltage law has great practical utility in the analysis of electric circuits. 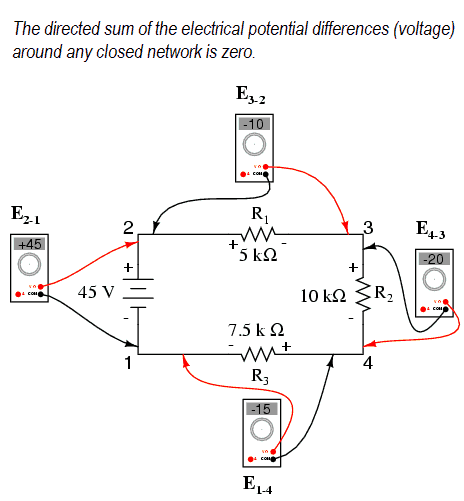 It is used in conjunction with the current law in many circuit analysis tasks. The concept of energy conservation is widely used also in chemistry. Chemical reactions are determined by the laws of thermodynamics. In thermodynamics, the internal energy of a system is the energy contained within the system, excluding the kinetic energy of motion of the system as a whole and the potential energy of the system as a whole due to external force fields. In thermodynamics, the internal energy include the translational kinetic energy of the molecules (in case of gases), the kinetic energy due to rotation of the molecules relative to their centers of mass and the kinetic energy associated with vibrational motions within the molecules. Energy cannot be created or destroyed. Energy may change form during a chemical reaction. For example, energy may change form from chemical energy to heat energy when gas burns in a furnace. The exact amount of energy remains after the reaction as before. This is true of all chemical reactions. In an endothermic reaction, the products have more stored chemical energy than the reactants. In an exothermic reaction, the opposite is true. The products have less stored chemical energy than the reactants. The excess energy is generally released to the surroundings when the reaction occurs. In a flame of pure hydrogen gas, burning in air, the hydrogen (H2) reacts with oxygen (O2) to form water (H2O) and releases energy. Consider the combustion of hydrogen in air. In a flame of pure hydrogen gas, burning in air, the hydrogen (H2) reacts with oxygen (O2) to form water (H2O) and releases energy. 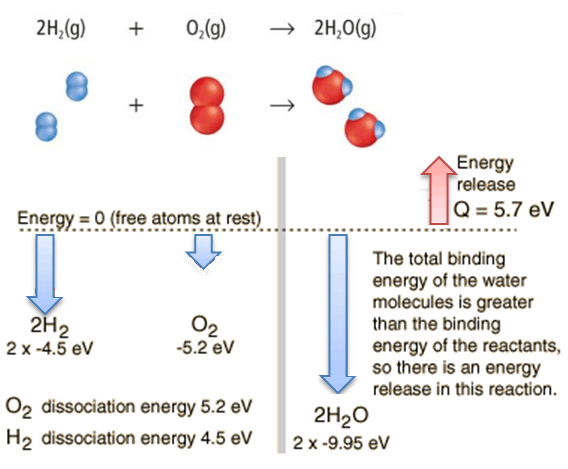 Energetically, the process can be considered to require the energy to dissociate the H2 and O2, but then the bonding of the H2O returns the system to a bound state with negative potential. It is actually more negative than the bound states of the reactants, and the formation of the two water molecules is therefore an exothermic reaction, which releases 5.7 eV of energy. The balance of energy before and after the reaction can be illustrated schematically with the state in which all atoms are free taken as the reference for energy. A nuclear reaction is considered to be the process in which two nuclear particles (two nuclei or a nucleus and a nucleon) interact to produce two or more nuclear particles or ˠ-rays (gamma rays). Thus, a nuclear reaction must cause a transformation of at least one nuclide to another. Sometimes if a nucleus interacts with another nucleus or particle without changing the nature of any nuclide, the process is referred to a nuclear scattering, rather than a nuclear reaction. In analyzing nuclear reactions, we apply the many conservation laws. Nuclear reactions are subject to classical conservation laws for charge, momentum, angular momentum, and energy (including rest energies). Additional conservation laws, not anticipated by classical physics, are are electric charge, lepton number and baryon number. Certain of these laws are obeyed under all circumstances, others are not. We have accepted conservation of energy and momentum. In all the examples given we assume that the number of protons and the number of neutrons is separately conserved. We shall find circumstances and conditions in which this rule is not true. Where we are considering non-relativistic nuclear reactions, it is essentially true. However, where we are considering relativistic nuclear energies or those involving the weak interactions, we shall find that these principles must be extended. Some conservation principles have arisen from theoretical considerations, others are just empirical relationships. Notwithstanding, any reaction not expressly forbidden by the conservation laws will generally occur, if perhaps at a slow rate. This expectation is based on quantum mechanics. Unless the barrier between the initial and final states is infinitely high, there is always a non-zero probability that a system will make the transition between them. For purposes of this article it is sufficient to note four of the fundamental laws governing these reactions. Conservation of nucleons. The total number of nucleons before and after a reaction are the same. 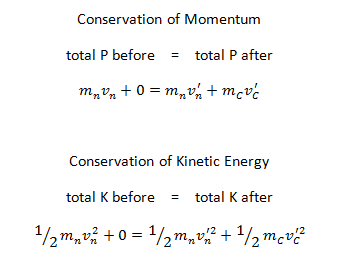 Conservation of momentum. The total momentum of the interacting particles before and after a reaction are the same. Conservation of energy. Energy, including rest mass energy, is conserved in nuclear reactions. Elastic scattering. Occurs, when no energy is transferred between the target nucleus and the incident particle. Inelastic scattering. Occurs, when energy is transferred. The difference of kinetic energies is saved in excited nuclide. Capture reactions. Both charged and neutral particles can be captured by nuclei. This is accompanied by the emission of ˠ-rays. Neutron capture reaction produces radioactive nuclides (induced radioactivity). Transfer Reactions. The absorption of a particle accompanied by the emission of one or more particles is called the transfer reaction. Fission reactions. Nuclear fission is a nuclear reaction in which the nucleus of an atom splits into smaller parts (lighter nuclei). The fission process often produces free neutronsand photons (in the form of gamma rays), and releases a large amount of energy. Fusion reactions. Occur when, two or more atomic nuclei collide at a very high speed and join to form a new type of atomic nucleus.The fusion reaction of deuterium and tritium is particularly interesting because of its potential of providing energy for the future. Spallation reactions. Occur, when a nucleus is hit by a particle with sufficient energy and momentum to knock out several small fragments or, smash it into many fragments. Alpha radioactivity. Alpha particles consist of two protons and two neutrons bound together into a particle identical to a helium nucleus. Because of its very large mass (more than 7000 times the mass of the beta particle) and its charge, it heavy ionizes material and has a very short range. In analyzing nuclear reactions, we have to apply the general law of conservation of mass-energy. According to this law mass and energy are equivalent and convertible one into the other. It is one of the striking results of Einstein’s theory of relativity. 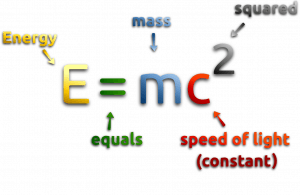 This equivalence of the mass and energy is described by Einstein’s famous formula E = mc2. Generally, in both chemical and nuclear reactions, some conversion between rest mass and energy occurs, so that the products generally have smaller or greater mass than the reactants. In general, the total (relativistic) energy must be conserved. The “missing” rest mass must therefore reappear as kinetic energy released in the reaction. The difference is a measure of the nuclear binding energy which holds the nucleus together. The nuclear binding energies are enormous, they are of the order of a million times greater than the electron binding energies of atoms. The energetics of nuclear reactions is determined by the Q-value of that reaction. The Q-value of the reaction is defined as the difference between the sum of the masses of the initial reactants and the sum of the masses of the final products, in energy units (usually in MeV). Consider a typical reaction, in which the projectile a and the target A gives place to two products, B and b. This can also be expressed in the notation that we used so far, a + A → B + b, or even in a more compact notation, A(a,b)B. For reactions in which there is an increase in the kinetic energy of the products Q is positive. The positive Q reactions are said to be exothermic (or exergic). There is a net release of energy, since the kinetic energy of the final state is greater than the kinetic energy of the initial state. For reactions in which there is a decrease in the kinetic energy of the products Q is negative. The negative Q reactions are said to be endothermic (or endoergic) and they require a net energy input. The DT fusion reaction of deuterium and tritium is particularly interesting because of its potential of providing energy for the future. Calculate the reaction Q-value. In nuclear reactors the gamma radiation plays a significant role also in reactor kinetics and in a subcriticality control. Especially in nuclear reactors with D2O moderator (CANDU reactors) or with Be reflectors (some experimental reactors). Neutrons can be produced also in (γ, n) reactions and therefore they are usually referred to as photoneutrons. A high energy photon (gamma ray) can under certain conditions eject a neutron from a nucleus. It occurs when its energy exceeds the binding energy of the neutron in the nucleus. 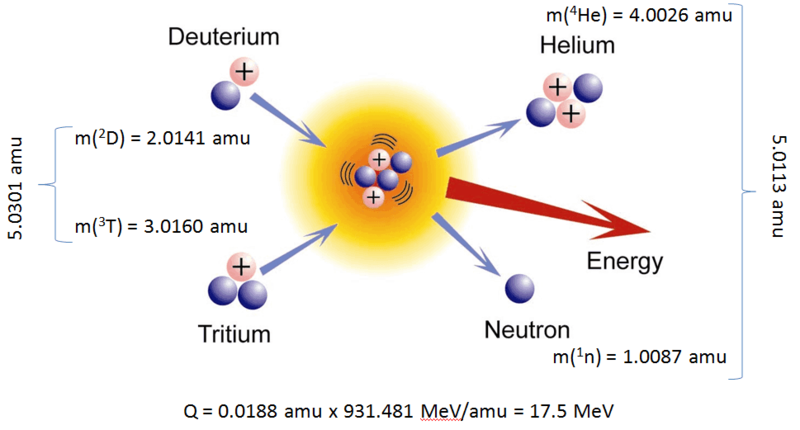 Most nuclei have binding energies in excess of 6 MeV, which is above the energy of most gamma rays from fission. On the other hand there are few nuclei with sufficiently low binding energy to be of practical interest. These are: 2D, 9Be, 6Li, 7Li and 13C. As can be seen from the table the lowest threshold have 9Be with 1.666 MeV and 2D with 2.226 MeV. Emission of gamma rays. Gamma rays are emitted by unstable nuclei in their transition from a high energy state to a lower state known as gamma decay. Metastable state. Some energy may remain in the nucleus, as a metastable energy level. A small amount of energy may also emerge in the form of X-rays. Generally, products of nuclear reactions may have different atomic numbers, and thus the configuration of their electron shells is different in comparison with reactants. As the electrons rearrange themselves and drop to lower energy levels, internal transition X-rays (X-rays with precisely defined emission lines) may be emitted. In general, the nuclear fission results in the release of enormous quantities of energy. The amount of energy depends strongly on the nucleus to be fissioned and also depends strongly on the kinetic energy of an incident neutron. In order to calculate the power of a reactor, it is necessary to be able precisely identify the individual components of this energy. At first, it is important to distinguish between the total energy released and the energy that can be recovered in a reactor. The total energy released in fission can be calculated from binding energies of initial target nucleus to be fissioned and binding energies of fission products. But not all the total energy can be recovered in a reactor. For example, about 10 MeV is released in the form of neutrinos (in fact antineutrinos). Since the neutrinos are weakly interacting (with extremely low cross-section of any interaction), they do not contribute to the energy that can be recovered in a reactor. Beta decay (β-decay) is a type of radioactive decay in which a beta particle, and a respective neutrino are emitted from an atomic nucleus. Beta radiation consist of beta particles that are high-energy, high-speed electrons or positrons are emitted during beta decay. By beta decay emission, a neutron is transformed into a proton by the emission of an electron, or conversely a proton is converted into a neutron by emission of a positron, thus changing the nuclide type. Beta decay of C-14 nucleus. The study of beta decay provided the first physical evidence for the existence of the neutrino. The discovery of the neutrino is based on the law of conservation of energy during the process of beta decay. In both alpha and gamma decay, the resulting particle (alpha particle or photon) has a narrow energy distribution, since the particle carries the energy from the difference between the initial and final nuclear states. 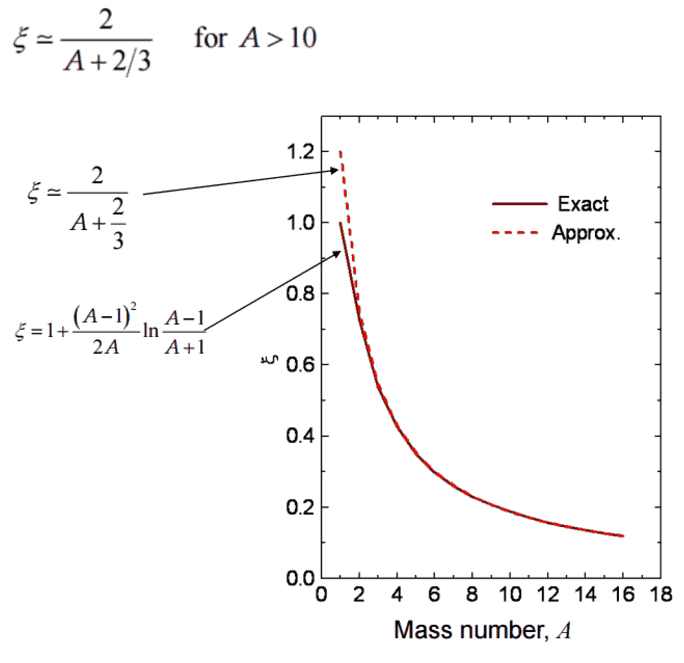 For example, in case of alpha decay, when a parent nucleus breaks down spontaneously to yield a daughter nucleus and an alpha particle, the sum of the mass of the two products does not quite equal the mass of the original nucleus (see Mass Defect). As a result of the law of conservation of energy, this difference appears in the form of the kinetic energy of the alpha particle. Since the same particles appear as products at every breakdown of a particular parent nucleus, the mass-difference should always be the same, and the kinetic energy of the alpha particles should also always be the same. In other words, the beam of alpha particles should be monoenergetic. It was expected that the same considerations would hold for a parent nucleus breaking down to a daughter nucleus and a beta particle. Because only the electron and the recoiling daughter nucleus were observed beta decay, the process was initially assumed to be a two body process, very much like alpha decay. It would seem reasonable to suppose that the beta particles would form also a monoenergetic beam. Since the electron is much lighter particle it was expected that it will carry away most of the released energy, which would have a unique value Te-. The shape of this energy curve depends on what fraction of the reaction energy (Q value-the amount of energy released by the reaction) is carried by the electron or neutrino. But the reality was different. The spectrum of beta particles measured by Lise Meitner and Otto Hahn in 1911 and by Jean Danysz in 1913 showed multiple lines on a diffuse background, however. Moreover virtually all of the emitted beta particles have energies below that predicted by energy conservation in two-body decays. The electrons emitted in beta decay have a continuous rather than a discrete spectrum appeared to contradict conservation of energy, under the then-current assumption that beta decay is the simple emission of an electron from a nucleus. When this was first observed, it appeared to threaten the survival of one of the most important conservation laws in physics! To account for this energy release, Pauli proposed (in 1931) that there was emitted in the decay process another particle, later named by Fermi the neutrino. It was clear, this particle must be highly penetrating and that the conservation of electric charge requires the neutrino to be electrically neutral. This would explain why it was so hard to detect this particle. The term neutrino comes from Italian meaning “little neutral one” and neutrinos are denoted by the Greek letter ν (nu). In the process of beta decay the neutrino carries the missing energy and also in this process the law of conservation of energy remains valid.